Georgia Totto O'Keeffe's "Pansies 1924"
"Nobody sees a flower, really, it is so small. We haven't time - and to see takes time like to have a friend takes time. If I could paint the flower exactly as I see it no one would see what I see because I would paint it small like the flower is small. So I said to myself - I'll paint what I see - what the flower is to me but I'll paint it big and they will be surprised into taking time to look at it - I will make even busy New Yorkers take time to see what I see of flowers. ...Well, I made you take time to look at what I saw and when you took time to really notice my flower you hung all your own associations with flowers on my flower and you write about my flower as if I think and see what you think and see of the flower - and I don't." The link went on to talk about her time at her home in Lake George, New York: "O'Keeffe not only used her natural surroundings at Lake George as a source of inspiration, she also mined the garden she maintained on the Stieglitz farm for fresh motifs and themes. In the summer of 1924, she began planting beds of blue and purple petunias in order to study their subtle, radiant hues. 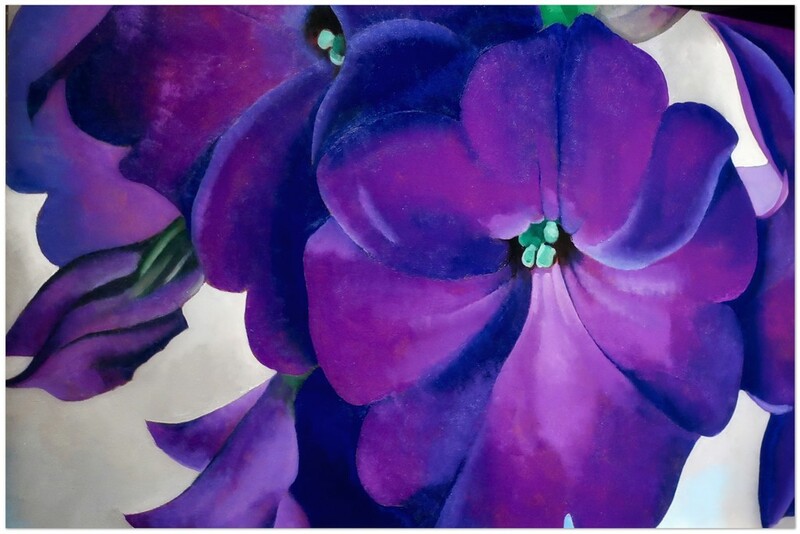 The growing of petunias that pivotal summer provided the impetus for her first enlarged floral painting, Petunia No. 2, an extraordinary prelude to the artist's flower paintings, long considered her most original contribution to twentieth-century art. O'Keeffe's preoccupation with petunias culminated in this 1924 canvas." She was such an extraordinary artist. For my purple rainbow photo today. Oh ... she really conveyed the richness of the tones and subtlety of the petunia so well! And you captured her iconic painting perfectly. @annied @farmreporter the more I read about her, the more I love her. She was her own woman and she did not care one whit about what people thought! A magnificent woman. Lovely image and I enjoyed your narrative. Such a beautiful image and great words. Beautiful capture. I love O'Keeffe's work. She was definitely one of a kind! Beautiful. I thought this looked familiar, LouAnn! Love it and its perfect for the rainbow month! :) fav. Such interesting information and a beautiful shot of her gorgeous art. Great to learn more about OKeefe and even nicer - to see one of her pictures! @bkbinthecity @beryl @mittens @jacqbb @taffy @henrir @ziggy77 @gijsje @carole_sandford @olivetreeann @gardenfolk @joansmor @pcoulson @onewing @grammyn @kwind @maggiemae @gigiflower Thank you all for your lovely comments and faves. This photo is on the TP and PP because of you. Thank you so much. Georgia was quite a gal!